For the price of one appliance, you can have this eight in one oven, capable of baking, broiling, roasting, grilling, toasting and designed for use as a griddle, bun warmer and rotisserie oven. It is like a smaller version of your regular oven, plus it can do many things your oven can't. As it does all of this, it saves time and electricity. The 3/5 cubic foot interior can contain a nine inch pie or six pieces of toast. It comes with a thirty minute timer with an automatic shutoff and signal bell. The quick clean interior is made more functional with a slide out crumb tray. Accessories include two reversible racks, a rotisserie spit and holder, and a baking pan. The front door is curved, all-view glass. A toasted bun makes any burger taste better; a warmed bun improves a hot dog. This machine helps take the components of your meal to the next level. Prepare your entire meal using just this countertop appliance or use it as backup to your main oven or stovetop. The special interior means any spills will wipe away. The oven comes with a one year warranty. George Foreman has another knockout with this one; nearly everyone who owns one raves about it. 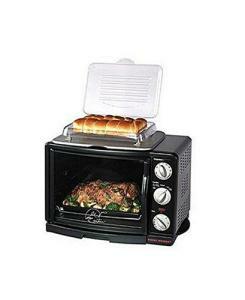 Another model to consider is the Ronco Showtime Rotisserie. Where can I get a Manual for this George Foreman Convection Oven.